They stroll the alleyways, sit upon thrones, lurk in dark caves, and ply their wares in every item shop. Non-Player Characters make up a good fraction of the game population. In effect, these representatives are the face of the game world for the player. In contrast to enemies, the main verbs available to these individuals are monologues, dialogs and buying/selling/giving items. It might be said that NPCs fit into specific typecast roles because that is how they are most useful for the game designer. In a world built out of limited content, there is little room for more than a token representation of “real” individuals, making the generic NPC rather shallow. Or are they? About a year ago, I made a sketch of a game called “NPC” (you can play it here, if you like – it even has music by Chen and graphics by Daniel!). Taking control of an ordinary peasant child, various adventurers may approach you and ask for a quest in order to gain experience and items. The quest is invariably to find a lost cat. In this experiment, the twist that I found most intriguing was the multiplicity of “parallel worlds”, such as it were. Multiple adventurers are tasked with finding a lost cat, and each of them supply an identical-looking cat at the end of their quest. At the end of the game, a summary screen proudly displays your feline collection, as provided by adventuring heroes, the “player characters”. One of the most famous NPCs is the Old Man from Legend of Zelda (1986). In the midst of a grassy field, surround by mountains, a small one-room cave is situated. The Old Man, accompanied by his long white beard, red habit and sword have been waiting patiently for you, the player. Framed by eternally-glowing fires, the ritual begins. The magic words are uttered: “It’s dangerous to go alone! Take this.” The Item is offered (sword). 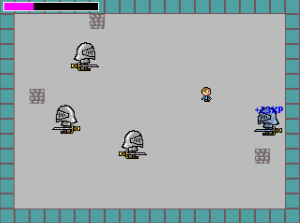 Newly armed, the player can continue the quest. Old Man is in quite a bind! 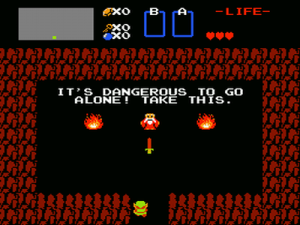 In the most recent Ludum Dare 48-hour game development competition, this “ritual” was the chosen theme: “It’s dangerous to go alone! Take this.” Many of the competition entries dealt with this famous Old Man scene, from all sorts of different angles. My take on the concept was to assume control of the Old Man himself, rushing from cave to cave and dispensing both crucial advice and Item against a ticking clock. From this viewpoint, each cave corresponds to a different player, perhaps even a different game universe. 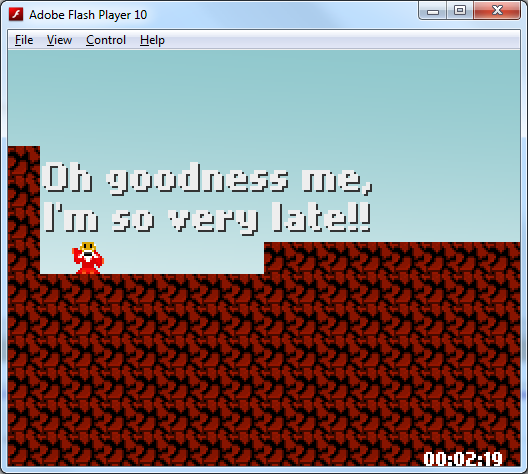 This is because the Old Man, much like other NPCs, can exist in an plane orthogonal to the player. As we have become accustomed, the player can explore a single slice of the multiverse, whereas the Old Man and his various counterparts exist simultaneously in all these different worlds and zones. Furthermore – some NPCs exist in all parallel universe and at all time. Old Man will wait for you, the player, for hundreds of thousands of years, if you make him wait that long. In fact, he is waiting for you right now. Even though we take the part of a Non-Player Character, the player is playing, so should they be known as Player Non-Player Characters (PNPCs)? Or, taken a step in the other direction: a single mind (the player) exploring a world of mindless automatons is reminiscent of solipsism. What can we learn from this game model that we can apply here on Earth? How do these in-game entities change as we add other player characters (multi user games)? How do they change as artificial intelligence is improved?